The complete audio collection of Alan Bennett's celebrated monologues, published together for the first time and performed by some of Britain's best actors. The Talking Heads monologues are widely regarded as one of Alan Bennett's finest dramatic achievements. First broadcast on BBC TV and BBC Radio 4 in the 1980s and 1990s, they won a host of awards and huge popular acclaim and remain among his most admired works today. This collection includes all twelve Talking Heads, plus the precursor of that series, 'A Woman of No Importance'. Beautifully crafted and full of compassion and wry observation, each tale is ripe with the quirky, insightful detail that has become Bennett's trademark. The monologues are: 'A Woman of No Importance' (Patricia Routledge); 'A Chip in the Sugar' (Alan Bennett); 'A Lady of Letters' (Patricia Routledge); 'Bed Among the Lentils' (Anna Massey); 'Soldiering On' (Stephanie Cole); 'Her Big Chance' (Julie Walters); 'A Cream Cracker Under the Settee' (ThoraHird); 'Miss Fozzard Finds Her Feet' (Patricia Routledge); 'The Hand of God' (Eileen Atkins); 'Playing Sandwiches' (David Haig); 'The Outside Dog' (Julie Walters); 'Nights in the Gardens of Spain' (Penelope Wilton) and 'Waiting for the Telegram' (Thora Hird). Intensely moving, deeply engrossing and highly entertaining, these spellbinding soliloquies are essential listening. The performances on these plays are top notch, every one. The stories themselves are depressing and sad. The characters are wonderfully fleshed out and real but maybe a little too real. I'll only listen to the rest if I need a good cry. 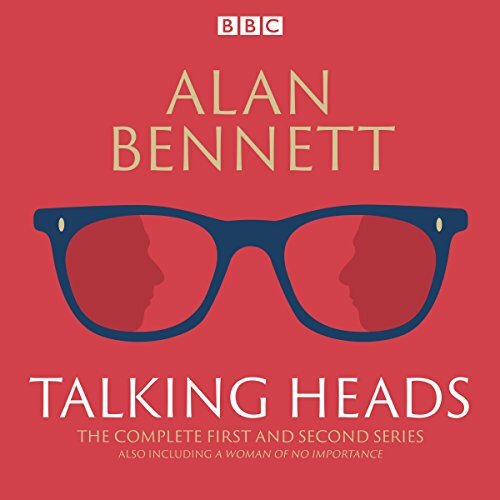 Alan Bennett's "Talking Heads" series deserves every ounce of praise possible. In each story we become acquainted with a heroine (on rare occasion, hero) in the midst of a personal struggle of one sort or another, and over the course of the monologue we learn through what is - and isn't - said just as much about the mental state of the storyteller as the events transpiring themselves. Each character, of course, sees things her (or his) own way, but unexpected revelations abound, and whether, by the end, the storyteller has understood the full impact of what's been happening is largely up to the audience to determine. "Talking Heads" was originally written for television, and was a unique proposition at the time, and later produced for radio (what we hear here), followed in book form, and each format excellently conveys Bennett's unique skills at observing, writing, and carrying his audience along throughout the course of the plot. These stories are meant to be enjoyed time and again, and something new is undoubtedly to be gleaned with each new visit.